Everyone is sick. Everyone. Half my kids’ class. Their teachers. Friends, neighbors. My daughter was sick all last week, briefly recovered, and then this very evening was felled by another passing ailment. I’m not sick. But just in case I decided I’d better take preventative action. When tout le monde is sick, what better than to attempt a garlic soup? And not just any garlic soup. But the one memorialized in Julia Child’s famous Mastering the Art of French Cooking. Yes, even I have this classic (thanks, Babs! ), although in the four years it’s been on my shelf I’ve been far too intimidated to try anything within its pages. and working my way up to scarier things, like, you know, Supremes de volaille en chaud-froid, blanche neige, or Diplomate pouding de cabinet. But not this week. 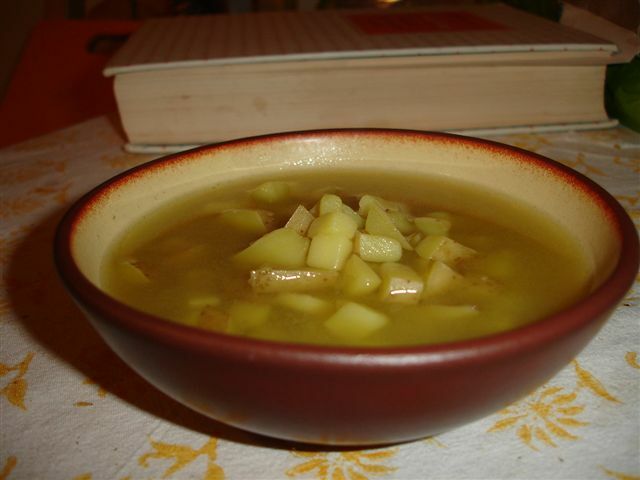 Tonight, soupe a l’ail aux pommes de terre (garlic soup with potatoes) seemed just within my abilities. I mean, it’s garlic and water, potatoes and some herbs. How bad could I mess it up? Separate a head of garlic so that you have about 16 cloves. Drop them into boiling water for 30 seconds, rinse with cold water, and peel. Boil slowly for 30 minutes. Strain it, and return to the saucepan. Add about 3 cups of diced “boiling potatoes” (I used Yukon Gold) and a good pinch of saffron to the broth and simmer for about 20 minutes or until the potatoes are tender. Correct the seasoning (whatever that means), and serve with French bread and grated Parmesan cheese. Naturally I played fast and loose with the herbs. My fresh bay leaves were apparently purged by the Flamenco Guitarist in the course of cleaning out my fridge (he still gets the purple badge of courage for taking on this ugly chore), and who has parsley laying around? But I had thyme and I had sage and I had cloves, and it was all smelling pretty good after a few simmery minutes. Oh yeah, and the saffron. I almost forgot the saffron. I redeemed myself at the last minute. The girl, sadly, was in bed, and not to be roused, although her brother kindly brought her up a bowl and put it at her bedside. She was already beyond the help of even Julia Child’s garlic soup. The question now is, am I? Stay tuned. Ah, MORE soup for you! Remember- make your body an inhospitable host! Mom’s aren’t allowed to get sick. Wow…I’ve never had garlic soup. And I’m quite a garlic fan. Thanks for sharing this!! In Spain, Sopa al Ajo, they make it a lot of different ways, but I love it with hot paprika ….